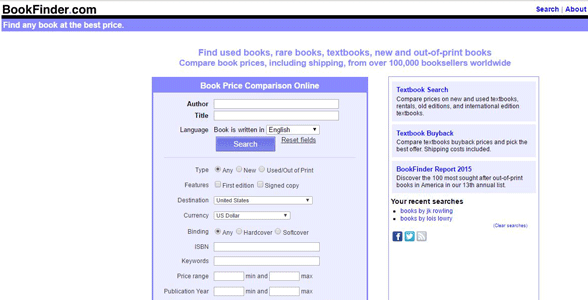 The Short Version: Launched in 1997, BookFinder.com is an online catalog of rare, new, used, and out-of-print books. If you want to give your loved one an original gift (or pick up something special for yourself) this resource provides easy tools to compare prices on hard-to-find copies from over 150,000 booksellers around the world. Advanced filtering features allow you to search by title, author, keyword, and other categories so you can narrow down your search for paper collectibles. Whether you’re looking for a limited-edition romance novel or a book signed by your partner’s favorite author, BookFinder will bring up a list of options for you to browse through and pick out just the right thing. The perfect gift takes finesse and legwork to pull off. First, you have to come up with something your loved one wants, and then you have to find it. Sometimes, that dream gift proves difficult to track down in the real world. For booklovers, BookFinder.com, a search engine for rare books, provides a shortcut to personalized presents, as it did for the site’s Public Relations Director, Scott Laming. Scott was on the hunt for a particular version of the Brothers Grimm’s collection of fairy tales to give to his wife. He patiently combed through BookFinder’s search results for the edition he knew his wife prized above all others — the one her grandfather had given her when she was a child. She’d once pored over the pages but now scarcely dared to touch the tattered and torn hardback for fear the book would fall apart in her hands. Scott searched BookFinder by publication date and soon found a copy of his wife’s favorite fairy tales — and in exquisite condition. With a click, he had the book sent to his wife’s grandfather so he could inscribe a note inside. Needless to say, when she opened the birthday present, she was blown away. On BookFinder.com, you can root out the exact copy of any title to treat yourself or to give it as a gift to someone special. First editions, limited editions, signed copies — if it’s available, the site will list it. BookFinder swiftly connects you to paper collectibles sold in more than 50 countries. The website pulls information from thousands of online booksellers big and small. By typing in a few desired details, romantic gift-givers can conduct a targeted search for a present that will wow that someone special. 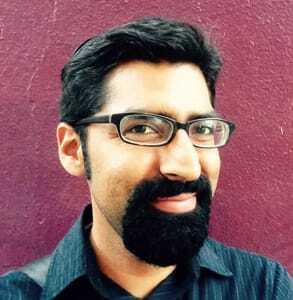 In 1996, Anirvan Chatterjee, book nerd and computer scientist, created the algorithm for a book search engine for school (and for pleasure). The 19-year-old University of California, Berkeley student got the idea for his final programming project when he wanted to find Doonesbury comics to add to his collection. Local bookstores couldn’t help him, so he went online, using his algorithm, to uncover obscure booksellers in a simple search. When he was 19 years old, Anirvan Chatterjee dreamed up BookFinder for a school project. Anirvan got an A on his school project, but his work didn’t end there. He felt he had something really valuable to offer avid book readers and collectors like himself. So, alongside his best friend Charlie Hsu, he began building the software that would become BookFinder.com. Predating Google’s rise to power, Anirvan’s literary search engine made it easier for avid readers to scour the newborn Internet for a certain edition of a book, no matter how rare. A favorite book is a personal treasure, close to the heart of who someone is. If you want to knock the socks off your date with a present that means something, take a look at his or her reading list. Booklovers tend to be vocal about beloved titles and authors, so it shouldn’t be too hard to get a sense of what names to search for on BookFinder.com. Then you can select “Signed” or “First Edition” to discover valuable books for sale by more than 150,000 online booksellers. The catalog stores a breadth of titles written in English, French, German, Italian, and Dutch. BookFinder users can filter by author, title, language, signed, price, keyword, binding, publication year, and other important parameters. Searching by “signed” is a particularly useful feature for gift-givers. You might get lucky and find a book signed to the name of your significant other. Scott told us the story of one woman who found a signed Ray Bradbury book personalized “To Dave” — which was her husband’s name. When she presented it to him, he was understandably shocked to receive a personal dedication from a deceased author. BookFinder.com lists more than just books — this website can find newspapers, magazines, sheet music, ticket stubs, love letters by famous people, and many other paper collectibles. Maybe you went on a date to a concert years back and want to bring back those memories, or maybe your partner will enjoy seeing the headlines in the newspaper on the day of his or her birth. There are plentiful opportunities to give a unique and meaningful present using BookFinder. All you have to do is search for them. As a tween, I stumbled upon a book called “A Walk to Remember,” and I adored the story, so I quickly ransacked my library for every book written by Nicholas Sparks. If you enjoy a book by a certain author, you might feel a similar impulse to look for other books by that person and then binge-read them. BookFinder can help you satisfy that urge. Using this website, you can easily compare prices, search out hard-to-find editions, and get exactly what you’re looking for. Nora Roberts is a bestselling author of over 200 romance novels, and her work can be found on BookFinder. Every year, the BookFinder Report publishes a list of the top 100 most searched for out-of-print book titles from the past year. 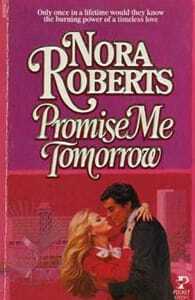 Nora Roberts’ “Promise Me Tomorrow,” written in 1984, often shows up on this list. Even though it’s long out of print, the book still tempts romance readers. Oftentimes, getting someone a personalized present is just a matter of paying attention. If you listen closely to their stories and understand their habits, you can probably think up something they’d adore, but then the challenge becomes finding that particular gift. 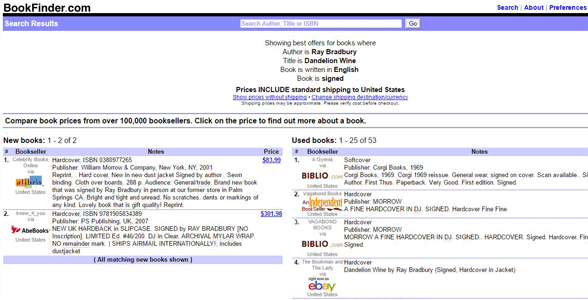 Since the ’90s, BookFinder.com has helped bibliophiles find the exact editions they want most. If your gift involves the written word, finding what you want isn’t a challenge at all. BookFinder.com helped Scott give his wife a meaningful present, and it can help you, too. 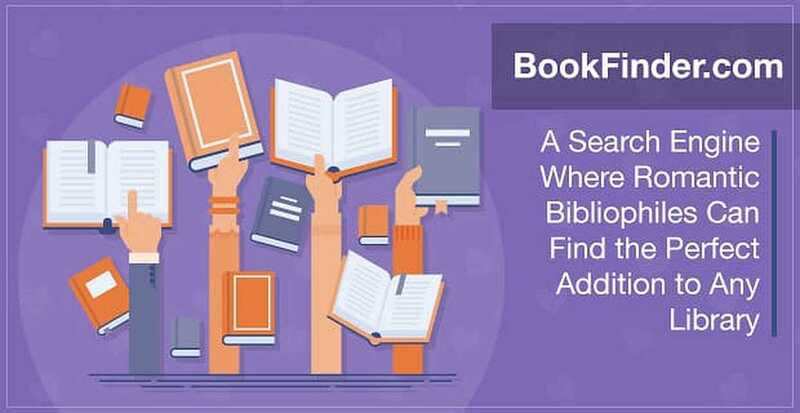 Sentimental bibliophiles can use BookFinder’s vast library to locate a book, newspaper, or other paper collectible to give someone a rare find or add to their own literary collections. “What people are looking for is so personal and unique to them,” Scott said. Anyone can pop on Amazon and do a simple search for a recently published book, but to go the extra mile and get something a little more interesting, go to BookFinder.com.